With the BOSU Balance Trainer Pro Edition one can train balance and stability in many ways. 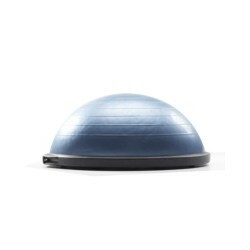 The BOSU Balance Trainer is three devices in one: exercise ball, balance board and platform. BOSU stands for "Both Sides Up" which means that both sides can be used. The Balance Trainer is suitable for yound and old, beginners and pros. Ordered one to rehab a broken leg and it became a crucial part in recovering mobility, strength and balance. I was also pleased to find out how multi-functional this thing is through all the tutorial videos on youtube. Ordered one to rehab a broken leg. Using it was a key element in my recovery. I was also pleased in finding out how multi-functional this thing is and the amount of exercise videos there are on youtube. The Bosu is of great quality, but I have since found the identical Bosu product at a much lower price.